My daughter has trouble activating hand brakes on her bike. She has small hands and she can hardly reach the handles, and the handles are too hard to pull. I saw the post on the adjustment but I was wondering if instead it would be possible to replace these terrible brakes with something better? I went to a store today and they told me that nothing better would fit the bike because it is a "price point bike". Well, I know it is a cheap bike but I have hard time believing that nothing can be done. What size bike is it ? 12, 16 or 20" wheels? 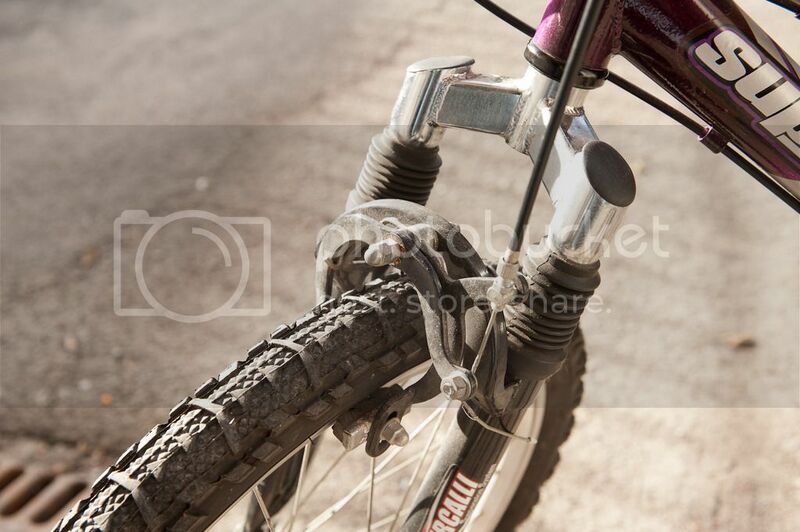 Sometimes you see the smaller hand brakes on the bikes for children under 9. If they are installed properly they should be easy to pull. 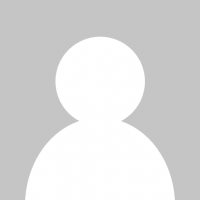 (04-19-2015, 02:55 AM)elmore leonard Wrote: What size bike is it ? 12, 16 or 20" wheels? Sometimes you see the smaller hand brakes on the bikes for children under 9. If they are installed properly they should be easy to pull. post some picture of the bicycle calipers and how they attach to frame and fork. there are better calipers you can use, but realize that for optimum performance you may need levers too. For calipers alone you could be looking @ around $50 give or take for the upgrade. 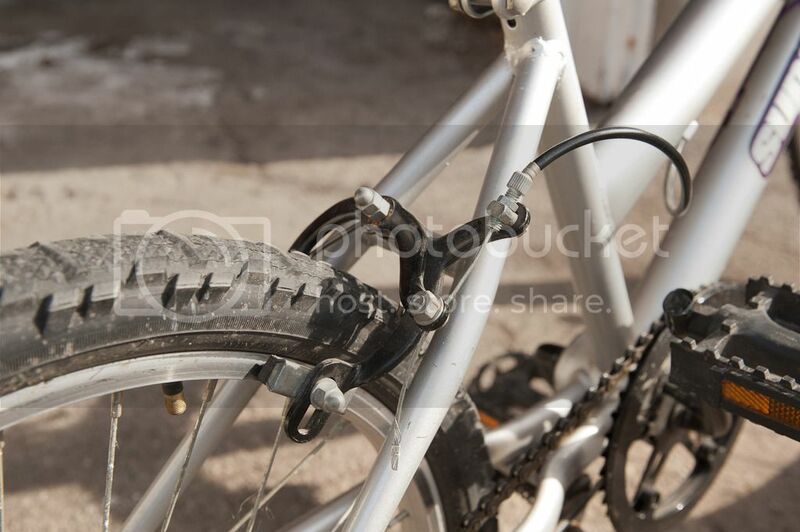 Another thing you may want to look at is the diameter of the brake cable. You can buy stainless steel brake cables that are thinner then the other non stainless cables on the market. They pull easier through the cable sheath or Jagwire as they call it. 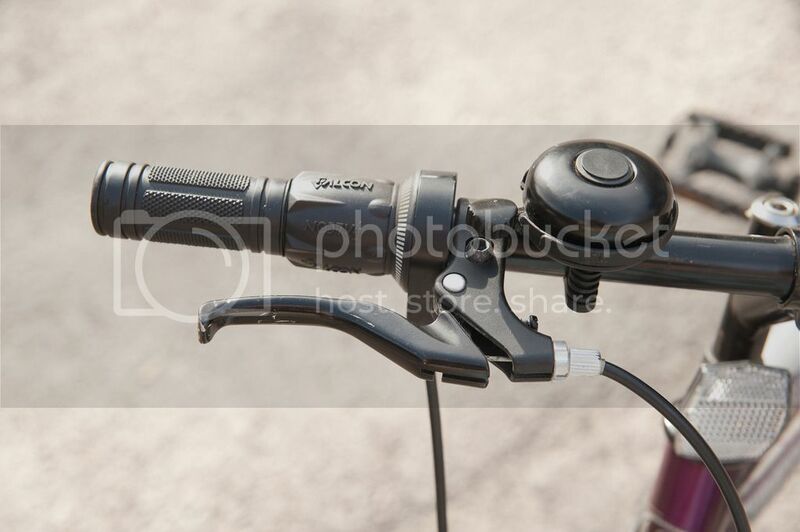 The lever looks fine, an upgrade on the side pull brakes would be fine But costly. 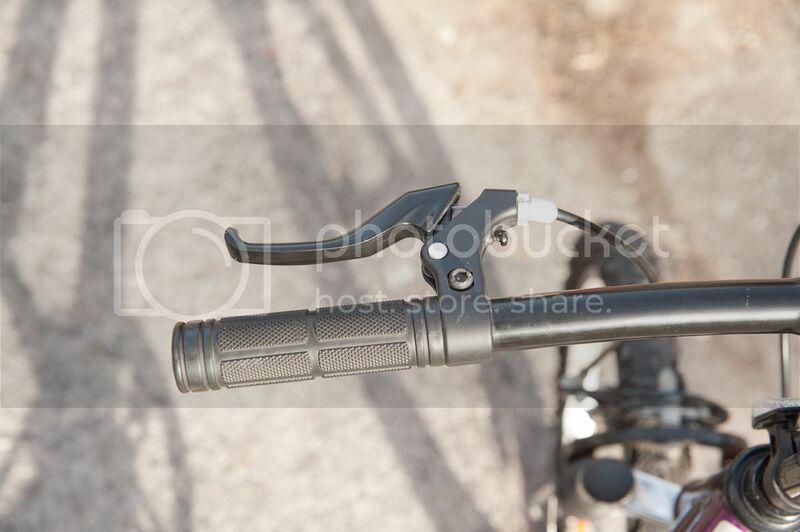 looks like in the picture they are using the same brake for the front and back. you need to measure the bolt length on each to make sure. generally they go thru the fork which is much wider than the fork brace in which yours is attached. the rear of course has a shorter bolt. when you order you need two rear brakes I am thinking. I am not an expert on dept. store bikes and have never seen that front setup like that. most brakes you buy come front and rear. that will not work for you. two rear may work. look at the following picture to understand what I mean. the long bolt one is for the front, the short bolt one is the rear. (04-19-2015, 11:17 PM)mmm Wrote: one thing about those brake assembly's is they cannot be fastened to tight or the brakes will not release properly. on the other side of the assembly are two nuts that tighten against each other to allow the brakes to open and close easily. A pro should have no trouble setting those up imho. also those are galvanized cables rather then the better performing stainless steel. Thanks a lot! How do I know if it is wide enough? wide enough? do you mean the caliper? (04-20-2015, 01:00 AM)elmore leonard Wrote: those cables look loose to me. 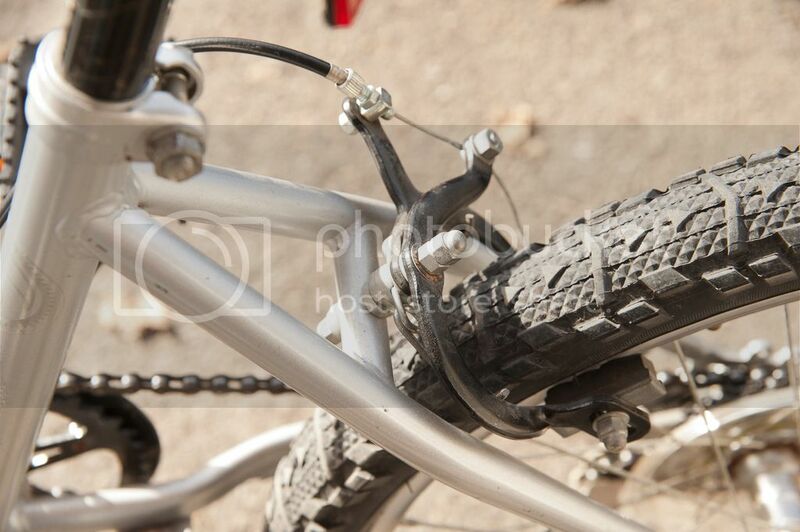 one thing about those brake assembly's is they cannot be fastened to tight or the brakes will not release properly. on the other side of the assembly are two nuts that tighten against each other to allow the brakes to open and close easily. A pro should have no trouble setting those up imho. also those are galvanized cables rather then the better performing stainless steel. Thanks for all the info. I will see if I can adjust the rear brake better. (04-20-2015, 01:40 AM)painkiller Wrote: wide enough? do you mean the caliper? 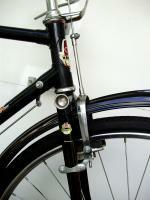 the reach is from the bolt center to the rim brake surface. you would be more long reach. the obround where the pad goes would be the min. and max. numbers you are looking at. the silver one in my second link are dual pivot long reach. (04-20-2015, 01:54 AM)painkiller Wrote: the reach is from the bolt center to the rim brake surface. you would be more long reach. the obround where the pad goes would be the min. and max. numbers you are looking at. the silver one in my second link are dual pivot long reach. Forgive my ignorance please but why is dual pivot better? I read the link but still am not sure. Thanks again. much nicer to center, and better spring action. (04-20-2015, 02:11 AM)painkiller Wrote: much nicer to center, and better spring action.